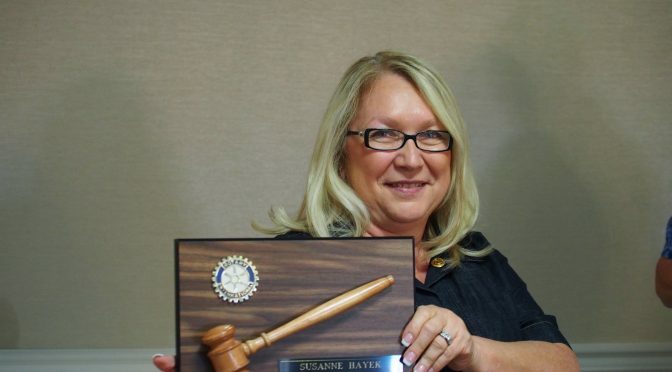 In an annual ritual of Rotary Clubs the world over, the Monrovia Rotary Club demoted 2016-2017 President, Susanne Hayek. The atmosphere was festive with a 4th of July theme of red, white, and blue flowers and balloons, white tablecloths and fun music arranged by club member and Monrovian Restaurant owner, Sia Soris. Headed by Past President Bill Shieff, and assisted by his Demotion Committee, Sylvia Domotor, Jan Mueting, and Erica Hahn, the evening was well coordinated and enjoyable. An amusing “roast” of the outgoing leader included more than a few “blond jokes”. A slide show of more than 350 images of the past Rotary year provided background to the proceedings, followed by the traditional president’s life video. Bryan Earll was honored with the Carlson Award, the Club’s highest award, for his outstanding commitment and service to the Club. Steve Baker was awarded a Lifetime Achievement Award for his 20 years of service to the club as a Past President, Board Member, and Executive Secretary. Jan Mueting was awarded “Tiger of the Year”, an annual tribute to the newer Rotarian who has made great contributions. Click here for more photos on FaceBook. It hardly seems possible that it was a year ago that I lead my first meeting. At that time, you may recall that I listed all the 21 past presidents of our club that are still active today. Because I think that is so remarkable I am going to list them again. 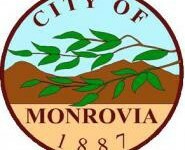 The Monrovia Rotary Club was chartered in 1922; This year, we are 95 years old. The club has 57 members and 21 are past presidents…this is very telling because it shows that we are an amazing team. People stop participating in Rotary when they don’t feel engaged or appreciated, or they feel overwhelmed or burned out. This doesn’t happen in our club because we work together and we support each other. I come away from my year as President with a deep affection for this club and its members. With a deep appreciation for all the grace that has been shown me and for the help that has been given me. I had barely been a member for two years when I was asked to serve as president. I didn’t even know every members name in the beginning. It was definitely a handicap not to have been steeped in the rich history of this venerable club but what made it possible was the help and guidance I received.